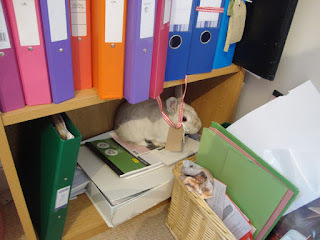 It is a happy day as I am finally introducing my new house rabbit. I have had him for about three weeks now but we have been quietly getting to know each other, and I wanted to give him chance to settle in before beginning his duties as Cottontails' new ambassador. So. Ladies and gentleman..... I present...... Rudolph! 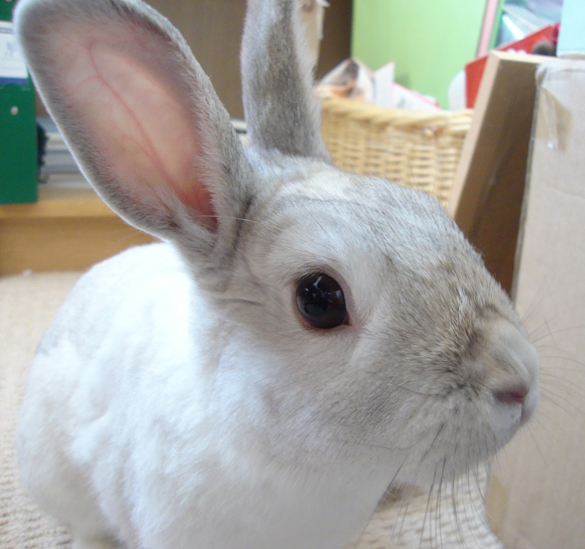 Rudolph is a little Netherland Dward cross bunny and we think he is about 18 months old. 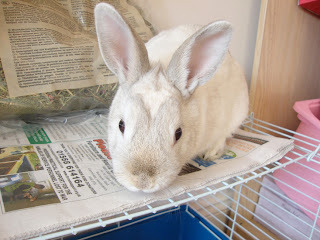 He is a 'rescue bunny' having been abandoned just before Christmas when his owner no longer wanted him. She didn't even say if he had a name, so the vet who took him in called him Rudolph. 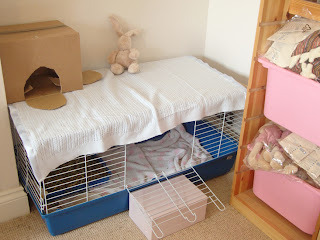 Happily Rudolph made it to a rescue center, The Essex Rabbit Rat and Guinea Pig Rescue. 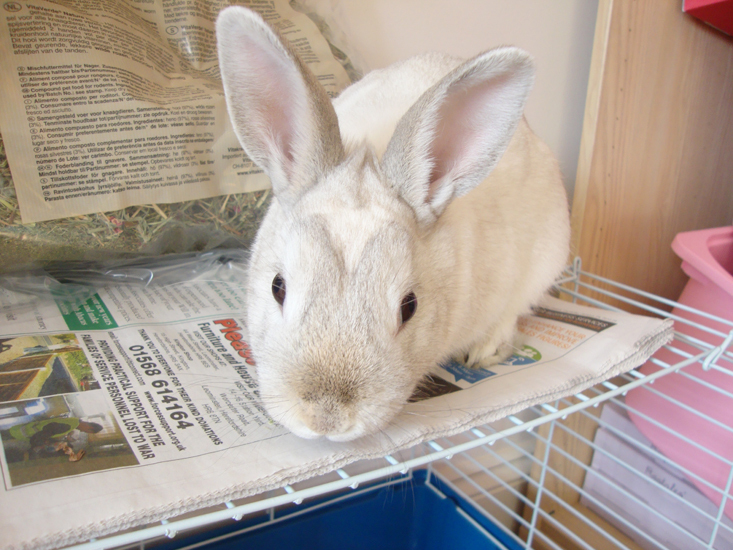 They took care of him, had him neutered and vaccinated, and listed him on the wonderful rescue website Rabbit Rehome, where I came across him. 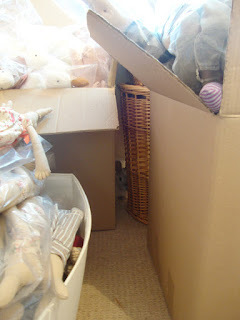 From when I initially spotted him, it took me about three weeks to take the plunge. Such a very big step, and dear Humphrey left such big paws to fill. There were several phone calls and emails to Wendy, the lovely lady who runs the rescue center. And then one Saturday on January I headed off down to Essex to pick him up. It was a 10 hour round trip! Madness probably, with so many rescue bunnies much closer, but I felt drawn to this little fellow, and as most rescue centers rehome their rabbits in pairs, I was happy to travel to find a single chap, to find the right bunny for me. Rudolph is settling in nicely and I already love him to bits! 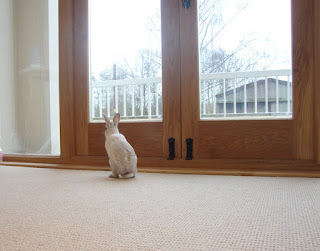 After a life in a tiny hutch, he is very much enjoying tearing around the house. 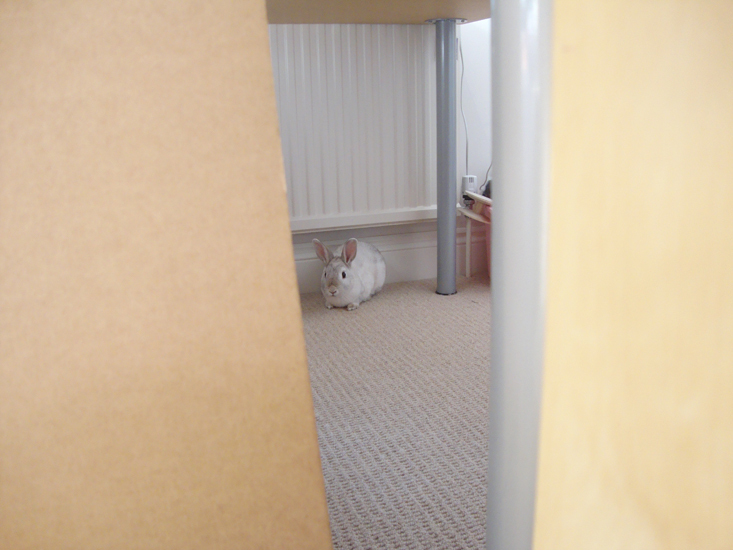 He creates quite a commotion, jumping and racing from the office, across the landing, into the bedroom and back. He hasn't discovered the stairs yet, but I don't think it will be long. And over the last couple of days he has started flopping over on to his back and falling asleep next to me - a sure sign that he is happy and relaxed - and that he trusts me. So far there has been no stock nibbling which is a huge relief. But he has chomped his way through a mobile phone charger. And a lamp cable. 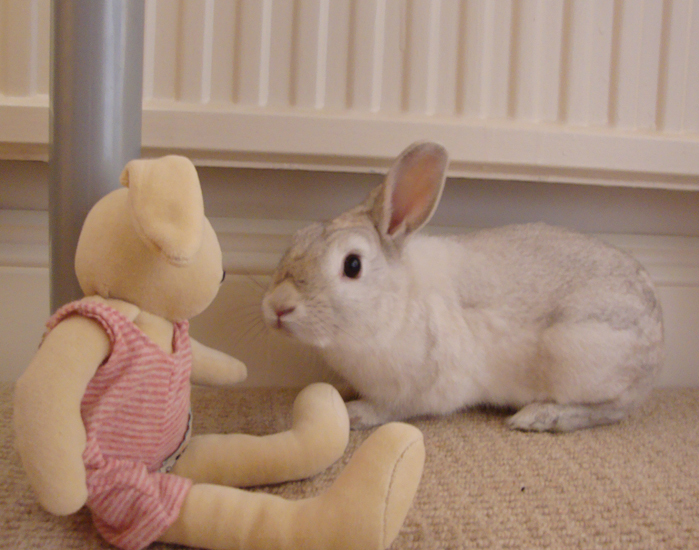 Both my fault for leaving such tasty nibble-magnets in his path - I am still adjusting from Humphrey, the most perfect and placid rabbit in the world. And he has a little quirk which I love.... he wags his tail! I have never, ever seen a rabbit do this before but he properly wags his little tail! I have looked it up and apparently it is a sign of excitement and / or defiance. It is very funny! Anyway, enough words. Let's get to the bit we've all been waiting for.... some photos! 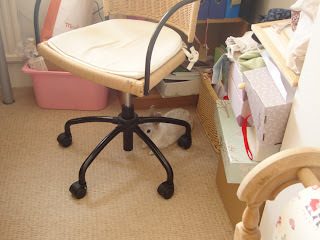 He often sits under my chair,. This is tricky - I must not wheel about..
Rudolph is such a cute bunny-looks like you have found a wonderful home. Adorable! I want a bunny! What a cutie pie! i'm so happy for you! 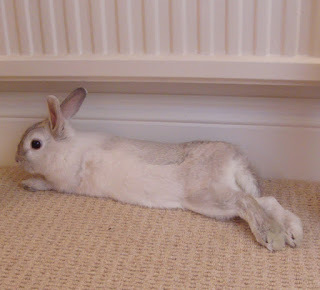 He's absolutely gorgeous, I have always wanted a house rabbit. 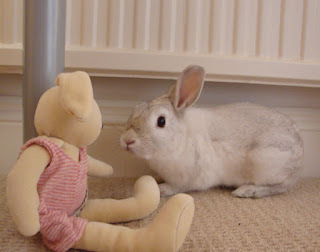 We had an outdoor one many years ago when I was little that lived in a large hutch or on the lawn in his run with his little guinea pig friend and played with us every day in the garden, much to the dismay of the neighbours. We were always having to knock on their doors asking could we come into their gardens to get our rabbit back. 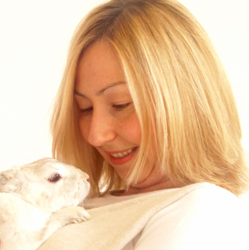 I hope you will be very happy together, Cottontails would not be the same without a resident bunny helper. Does Rudolph have any notion of the very special place he has inherited from the beautiful Humphrey I wonder. omg!!! he is totally adorable Charlotte :) love him to bits! so incredibly handsome and beautiful and I am sure Humphrey approves with all his heart and has given many blessings. wagging his tail is indeed defiance and excitement. my little furs often do that. Wes not so much but Arabella did and she was fiesty and determined. Adorable! So glad that you were able to find a new Bunny friend to help you with your work and be a fuzzysoft companion for your life! Rudolph is quite the handsome fellow! Oh. My. Goodness. He is wonderful and such a handsome boy. Bless his heart. oh Rudolph is adorable, and how sweet that he wags his tail! Oh Charlotte he is adorable! I can see why you made a 10 hour trip to get him! But I can't believe you probably drove past us and I didn't know, would have loved to have you in for coffee and meet Buttons... if you ever come to Essex again let us know! I think Rudolf looks like he may be more assistance with your tax return next year than those pesky ducks were! What a cutie! I hope you made it clear to him the responsibilities and just plain hard work involved in being the Cottontails Baby rabbit. It's not all glam and glitz, as many would think. He looks absolutely perfect.